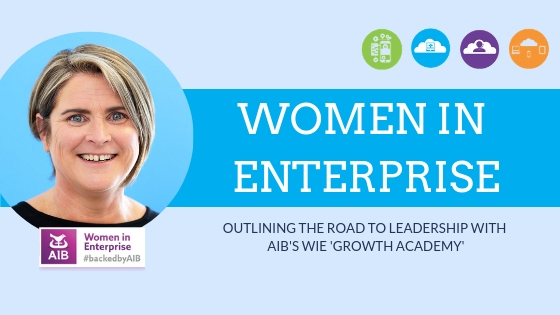 Enterprise Solutions Director, Denise Cullen continues her road to leadership with AIB’s Women in Enterprise ‘Growth Academy’. As I woke up in the morning to the most amazing sunrise, I acknowledged to myself the mix of emotions that ran through me. There was a sense of excitement to see my fellow leaders as well as the sense of apprehension; did I do my ‘Homework’ right? For me, this was a big step back in time. Our first homework task had consisted of reading six chapters of “The 21 Irrefutable Laws of Leadership” by John C Maxwell. I love this book and my only regret is that I didn’t read it 20 years ago. Another requirement was to complete a ‘Leadership Journal’. Unsure about the task, I found it really made me think and help me prioritise my thoughts. The final step was the ‘Leadership Tracker’ which helped capture what we learnt in our first session. As I walked into the room, Joanne, Sarah-Lynn and Lorraine were there with big smiles greeting each of us by name. The top table had a selection of fun looking things on it. A beach ball, a game of Jenga, a few books, brightly coloured pens and post cards with a selection of extremely inspirational quotes. Breakfast was served, and the buzz of excitement increased as each person arrived. As we divided into groups, Joanna kicked off our session with group discussions about our completed Leadership Trackers. Perception – the way in which something is regarded, understood and interpreted. “Walk a mile in their shoes to completely understand them and their point of view”. For me, I found the exercise fantastic. It clearly showed me how I need to step back and consider the other members of my Management Teams points of view. I need to take time to walk around the problem, view it from all the different angles, value the view everyone has and remember how everyone see something different. Then we moved into understanding ourselves better. For us to be good leaders, we need to understand ourselves first; knowing the type of person we are will help us understand our team better. This was extremely interesting and I found myself putting all my colleagues into the Disc Profile, it made for some interesting reading ……..
As I left the meeting, my mind spinning with all that I had learnt, I realised that if I could introduce one element of what I learned at each meeting of the Growth Academy, then Enterprise Solutions as a company would benefit hugely with a new and improved Leader, equipped with the tools to support our team and help each of them on their journey of personal growth. Once again, I would like to expend my gratitude to AIB for their amazing support and for giving this opportunity an amazing group of ladies from all different industries across Ireland, all with one common goal to become the best Leaders we can be.